Regional Forest Agreements (RFAs) are 20-year Commonwealth-state agreements to exempt logging in public native forests from Commonwealth environmental laws and hand the states responsibility for environmental protection. When introduced, RFAs added some areas to the reserve system, lifted controls on export woodchipping and intensified native forest logging. The Commonwealth accredited state laws and processes for logging approvals and agreed to compensate the states if it took a conservation action that restricts logging. Ten RFAs were signed between 1997 and 2001 covering forest regions in NSW, Victoria, Tasmania and WA. They are due to expire between 2017 and 2021 and can only be extended with the agreement of the Commonwealth and each state government. RFAs are founded on an inter-governmental agreement made in 1992 - the National Forest Policy Statement (NFPS). In it all Australian governments agree, amongst other things, to conserve “the full suite” of forest values for current and future generations. They commit to the conservation of the biological diversity associated with forests, particularly endangered and vulnerable species and communities. They commit to protecting places of cultural significance to Aboriginal people. RFAs claim to have complied with environmental legislation current when they were signed in the 1990s but incorporate few unambiguous safeguards for managing logging and its impacts. An exception is the performance review to be completed every five years which is the basis of the Possums Case. But these required reviews have generally not been completed on time or at all. During the third five-year review the parties to an RFA - the Commonwealth and state governments - can agree a process for extending the RFA beyond 20 years. As the RFAs reach their end dates between 2017 and 2021, governments are negotiating behind closed doors to extend them. Tasmania and the Commonwealth signed what amounts to a re-written RFA in August 2017, effectively making it perpetual. WA published a purported ‘third’ five-year review report in May 2017; NSW and Victoria are preparing reports as part of their ‘third’ five year reviews. Administratively - and tellingly - primary responsibility for RFAs lies with the Commonwealth Agriculture Department. Legally, RFAs are enabled under the Commonwealth logging law - the Regional Forest Agreements Act. The exemption from Commonwealth environmental scrutiny is through s38 of the Environment Protection and Biodiversity Conservation (EPBC) Act. 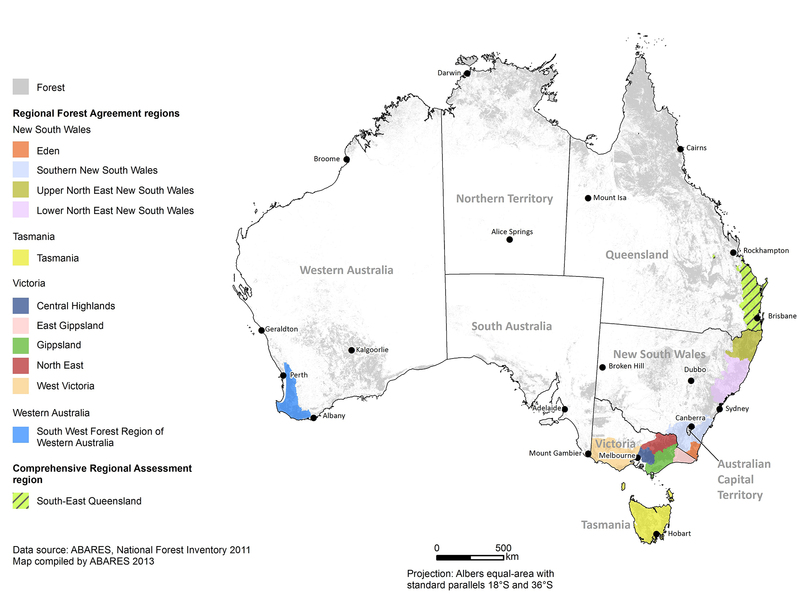 RFAs cover 6.3 million hectares of public native forests in ten regions of NSW, Victoria, Tasmania and WA. Queensland did not complete the process and has no RFA.